December 2009 saw a lot of clouded sky, a few clear frosty skies, and lots of snow (for our country at least). 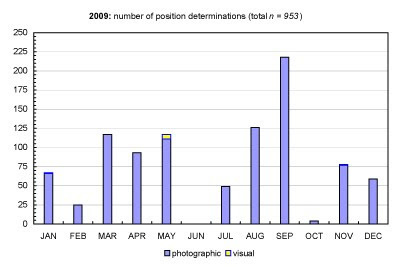 After my December 6th observations (see previous post) I observed on December 13th (under modest conditions) and December 28th (under good conditions). 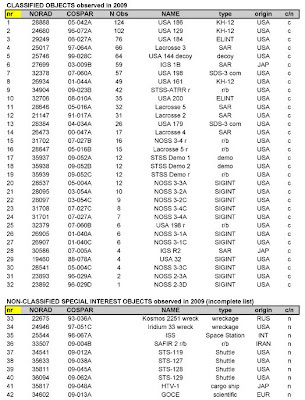 Targets imaged were the HEO objects USA 179 (04-034A), USA 184 (06-027A) and USA 198 (07-060A), and the STSS Demo objects (09-052A & B); and the LEO objects Lacrosse 2 (91-017A) and Lacrosse 5 (05-016A). These are probably my last observations for this year, as today is overcast and tonight will see fireworks. 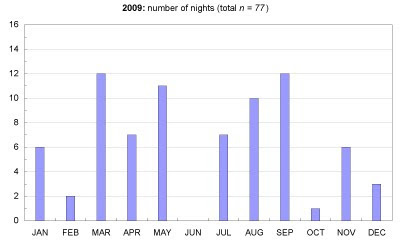 So, what did 2009 bring on the observational front? The clustering in certain positions is because I tend to select sky areas with easily recognizable bright star patterns. This helps easy aiming of the camrea, and it also speedens initial star identifications during the astrometric reduction of the images.